Is your little girl at the Royal Childrens? Lauren spent a couple of months there in 7-West. I know it can be a difficult time. I still feel like it was one of my happiest days when we finally brought her home. We are very thankful for all they did. Hang in there. I couldn't eat MacDonalds for years afterwards (No offence Bernie). They have a McD's down stairs at the RC and I was forever getting dinner from there while we waited and wondered. Everytime I looked at a BigMac I felt that same pain. Hi Mike, yes mate, she gets to spend her time in the cancer ward on the 6th floor of the Royal Childrens whenever she gets a temperature. It is hard at times but she always has a smile on her face. Maybe this thread deserves its own sub-heading on the Forum rather than as only a thread? Good point and I know this is under consideration. It was an idea to get everyone on and get some great dialogue going. With nearly 70 'Posts' I think the concept/idea of a 'Pool Room' has merit. "I'd open my mind, but I don't want the stupid to corrupt it." Gawd, no wonder he got exported . Nuh, I'm not gonna visit China .... I've heard the best for olé buggers like me is India. I've heard they have perfected the art of snake charming . If they can get a cobra snake to rise up outta a cane basket then there's still hope for me. So as you all coming out of winter? I am trying to get used to the whole idea of you all being up-side-down. Bernie, thanks for inviting me...I am sure these other blokes will blame you for all of the insults I deliver. 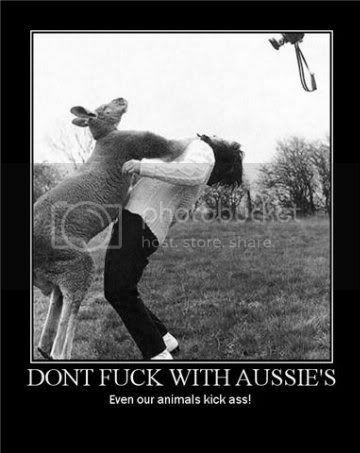 Does this stuff happen "Down Under" too? I have just been reading about your situation and my heart goes out to you and your family. I pray that everything has been caught in time. Keep a positive attitude...that will keep her smiling. Since Bernie has other obligations during Run N Gun will there be anyone from Austrailia or New Zealand coming over to the event this year? by the way it's Bernie's fault I am here as well. Hi Clois, we appreciate your support. She is a tough little kid and she will get through it. Its just hard watching an innocent little girl have to go through such invasive treatment. I have lost count of the amount of times i have wished we could trade places. On the flip side, everyone has different issues that they are dealing with, so you can only do your best. I know once i get this Cobra on the road there will be smiles all round! Boxhead...LOVE the 'light bulb' posting. Dear god, this is SO true about EVERY forum...given an hour or so, we could all identify who fits into each category on THIS one...ROFL!! Call in at Ronald McDonald House. Even if just for a coffee tell them I told you to call in and say Hi. You will meet some other parents and volunteers who have and are in the same situation. What did you think of the Python visit. I see they have 'posted' a couple of pictures of the day. George and Maggie are good hosts and good to be with. Thanks for visiting the 'POOL ROOM'. Yes, I'll miss all the fun at the Run N Gun this year. Clois, I had planned on getting back over to your place there in Oklahoma prior and assisting with cars. But I'm caught up here. In fact, I may not even get to our own event the Australian Nationals. Basically, the building and renovation jobs have gone a lot quicker than first thought, so I have some sign offs. I'm also with swim pool guys to finalise a job in Geelong. This is right in the middle of the Run N Gun.. I'm starting other renovations and building in Mt. Gambier so I have trapped myself..
Looks like the Australian group now is three heading over to the Run N Gun. One will be driving for RCR in an SLC coupe. Have fun. Hope you get the Cobra ready and the GT40 fixed for the track. Of course not.. we all know he would be wearing a hat with corks or croc teeth around the brim and have a huge knife strapped to his leg..
Cameron, Aussies don't say "Darn". Bloody or Flamin' are suitable Australian alternatives to "Darn"
See, no mention of the word "Darn" in here.